One of the best things about volunteering in the collection of the Knitting & Crochet Guild is the opportunity to see the pieces close up. As we sort them out, the ones that are really in need of a wash, which is in fact, most of them, come home with us volunteers to be given the treatment. 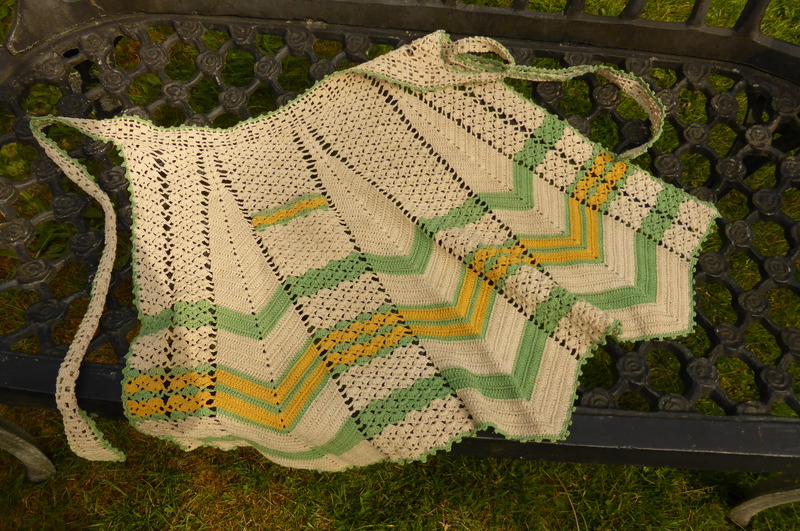 And last but not least, a crochet apron (yes really). 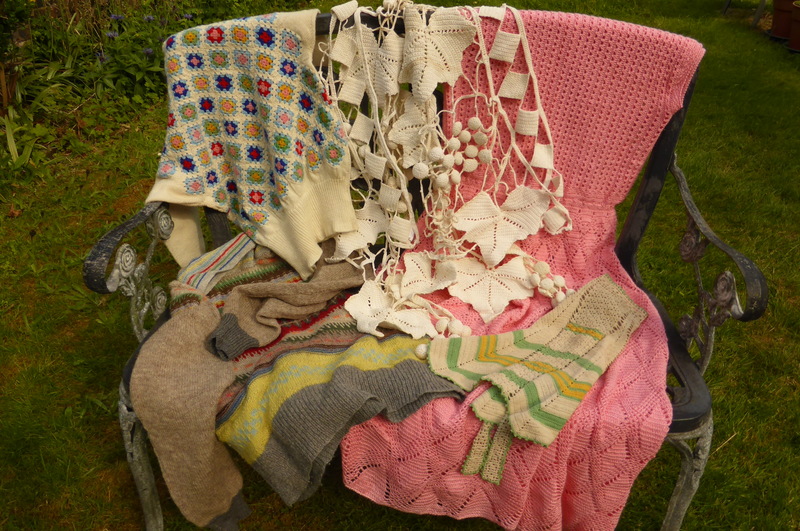 So, with a nod to the Orange Swan, author of one of my favourite blogs ‘The Knitting Needle and the Damage done’, let’s have a look at these. The pink dress is notable for several reasons – it’s beautifully made and has been worn, perhaps for a special occasion as it is floor length (one of several in the collection). I think it’s from the late 60s or early 70s but could be wrong on that. There is a lot of work in it, especially when compared to many current projects. 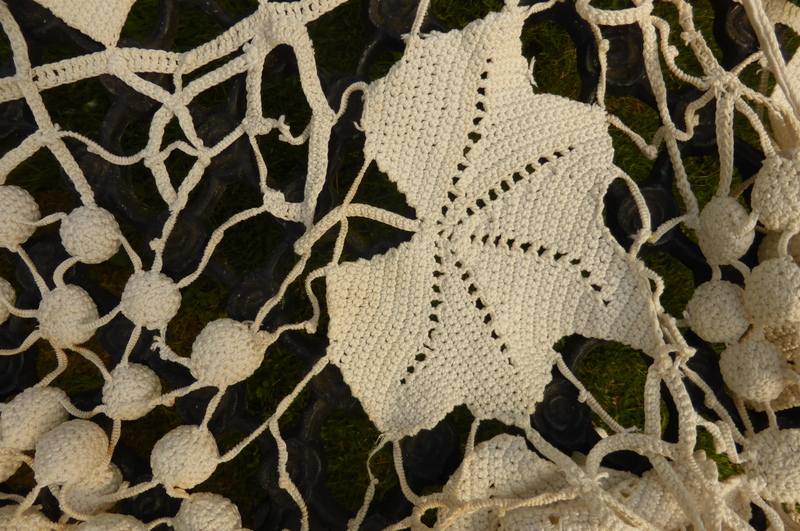 This piece is from a time when crochet was high fashion, and you could have a piece of that fashion by making it yourself. The yarn is a light synthetic which has a rayon-y look to it, but I’m not sure exactly what it is. The armhole trims have been finished in another lighter colour yarn, turned under, and the index card for the piece says that the maker ran out of yarn before quite finishing the dress. It has a zip up the centre back, nicely put in. We have a box for items that are made from both knit and crochet and that is where this next piece will go on its return to Lee Mills. I think it’s a work of art. 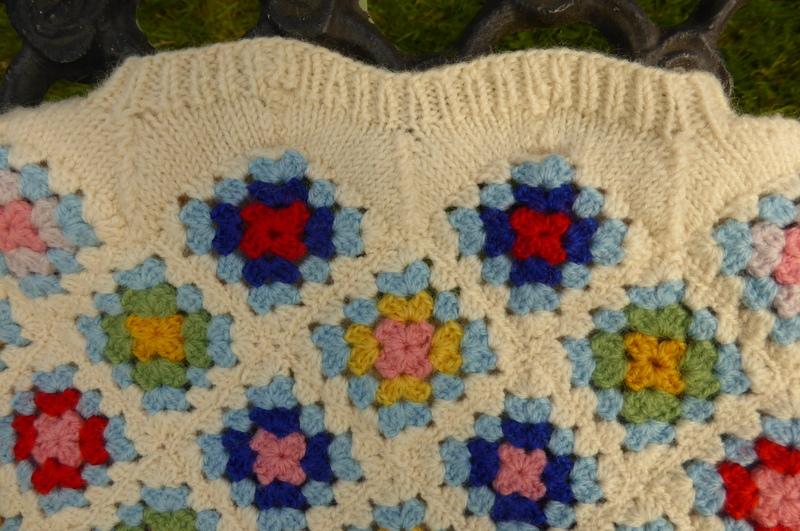 The front and back are standard ‘granny’ squares, in probably 4 ply wool or perhaps a light DK, but then they’ve been turned into a jumper by being knitted into and given sleeves, a neck and trim. The skill with which this has been done can be seen, I hope in this picture of the neck edge where the edges of the crochet have been picked up and knitted, with sharp decreases and I think, increases making the knitting lie flat. The next garment is also a jumper – this time in colour and texture combined, similar to the Bohus garments. It’s in wool, perhaps left overs, and it’s been well worn. It’s not a perfect piece of knitting by any means but it has a life and character about it which make it very special I think. Here’s a close up of the front – the sleeves are plain fawn knitting. And then there’s two more pieces of crochet, a hostess apron and a curtain. The apron is one of several that we have in the collection. They seem to have been popular in the 1950s, when housewives were being told that their place was in the home (post war, men returning, needed their jobs back etc ). 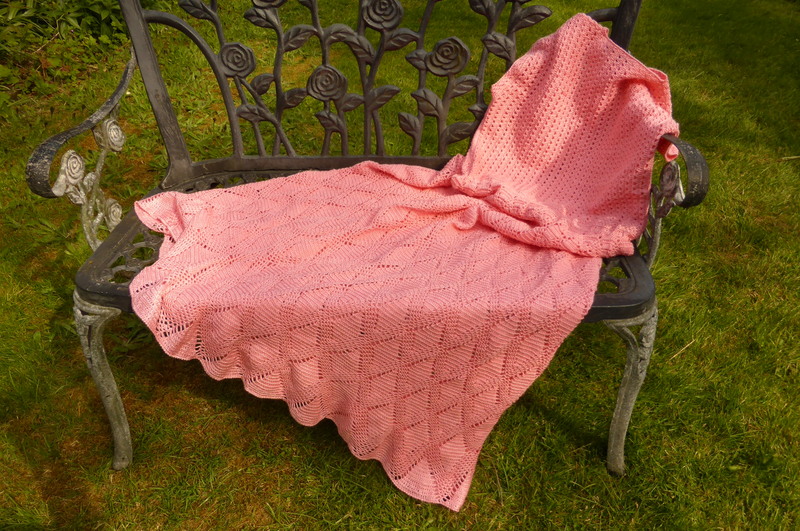 As the theme for the Knitting&Crochet Guild shows is ‘Afternoon Tea’ this year, we have an excuse to get these out, along with tea cosies, tea dresses, tableclothes, doilies, sugar basin covers and all sorts of things. Next time I have a batch of exciting and precious washing I’ll try to remember to take some pictures and show you more from the KCG Collection.